Born in Dublin in 1652, Nahum Tate was brought up in a puritan household and grew to be one of the most popular writers of his time. Perhaps most famous for his adaptation of King Lear and other Shakespeare plays, Tate was also a talented poem and hymn writer who lived for most of his life in London. After his father informed against the Irish Rebellion, the family home had been burned down in 1641, leading him to move to London for a while before returning shortly before the birth of his son. Nahum Tate followed in his father’s footsteps by attending Trinity College in Dublin where he completed his studies in 1672 though he did not go into the clergy. A few years later, Tate decided to leave Ireland and headed to London where he started to work as a writer. Living in the suburbs of London, near Southwark, he would remain in the city for the rest of his life and published his first collection of verse in 1677. It was, however, writing for the stage that allowed Tate to earn a reasonable living and he was quickly making his name with plays such as Brutus of Alba and The Loyal General that played at prestigious London theaters. In 1681 Tate wrote The Sicilian Usurper which was a loose adaptation of Shakespeare’s play Richard II but this was stopped after just three performances because it had some political undertones that the government of the time did not agree with. Tate was better known for another rewrite of Shakespeare when he produced the play The History of King Lear. In fact, he rewrote several of Shakespeare’s works, all under different titles and with alterations to the endings. Tate was friends with poet John Dryden and the two collaborated in 1682 to publish Absalom and Achitophel, an epic poem that was quite popular at the time. The first part of this political satire was written by Dryden but Tate penned most of the second part, except for a few sections. 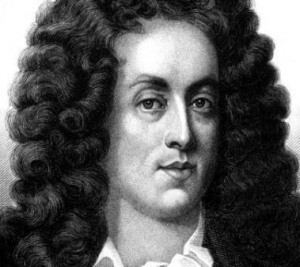 Tate also composed the libretto for a work by Henry Purcell and wrote a birthday verse in honor of his friend, Come Ye Sons of Art. Over his lifetime, Tate collaborated with a number of leading lights in 17th Century London including fellow Irish poet Nicholas Brady. Perhaps his most popular hymn was While Shepherds Watched Their Flocks though he was often criticized over the originality of his works. He wrote a large number of poems, the most often quoted of which, and perhaps the most original, was Panacea, a poem on Tea which was published in 1700. Tate became so well known in London that he was made Poet Laureate in 1692, despite his widely known political affiliations. In later years, he suffered from money problems and spent much of his time trying to avoid various creditors. Tate died in Southwark in 1715 at the age of 62. He is still perhaps best known for his rewriting of several Shakespeare classics where he added happy endings.